This wonderful book could not have appeared at a better time. 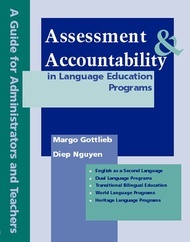 We are most fortunate that Margo Gottlieb and Diep Nguyen have created a rational and durable framework for orchestrating the competing demands on educators for accountability, program improvement, and appropriate classroom instruction. They delineate the complex issues of assessment in linguistically diverse settings and adeptly address the different dimensions along which educators are asked to evaluate their students and their programs. A clear strength of this volume is the clarity in the presentation of the information and the reader-friendly graphs and charts. At a time when educators experience the competing demands of accountability, program improvement and appropriate classroom instruction, this volume presents complex assessment issues from a variety of diverse perspectives and offers solutions at all levels. Research is also at the fore...where Gottlieb & Nguyen draw on empirical evidence to promote their BASIC model. They describe research-based principles of assessment that help define the nature, role, and uses of different kinds of data that might be acquired through formal and informal assessments. Even though the target audience for the Gottlieb & Nguyen book is administrators and teachers, I feel that it is very accessible for the average classroom teacher. This is helped by the initial features of the chapters 'Chapter overview', 'Guiding questions' and 'Key concepts', and those at the end, 'Questions for reflection and action'. Addressed primarily to language teachers and language education program administrators on the school, program, and district levels in the U.S., it offers a language assessment planning and implementation model intended to balance state-mandated assessment-instruments of policy with school-based assessment plans, giving language educators a constructive voice in how they assess their English language learners (ELLs) in the current era of high-stakes accountability in U.S. education. The book can be used in self-study, but lends itself well to teacher training workshops. Content is adumbrated at the beginning of each chapter by a short ''Overview,'' ''Guiding Questions,'' and three ''Key Concepts.'' The end of each chapter offers ''Questions for Reflection and Action,'' which mirror and elaborate on the Guiding Questions. There is an Appendix containing eighteen worksheets for educator self-reflection and workshop group discussion. Finally, there is a glossary, a bibliography containing scholarly references as well as references to commercially available language assessments noted in the text, and an index referencing text, tables, and diagrammatic figures. Another useful feature is the level of generality at which the BASIC model is articulated—not as a whole-cloth approach to be imposed, but as a multifaceted, integrated heuristic applicable to a wide range of language education contexts. Such flexibility, supplemented with concrete examples of implementation (as in Chapters 4, 5, and 6) is a major strength of the book. As such the model may well fall under the category of democratic approaches to assessment in which power is shared among different administrative levels. The work presents a detailed report of a localized, collaborative, and constructive response to the far-reaching No Child Left Behind Act. The model may also suggest a general framework for language education program analysis, and a way of generating hypotheses regarding policy on the state, district, and program levels.